PAGASA announces that the weather forecast for Holy Week 2013 will be good but have an isolated rain showers and possible thunderstorm. General outlook for March indicates hot weather with thunderstorms in the afternoon or evening, PAGASA forecaster Aldczar Aurelio said. 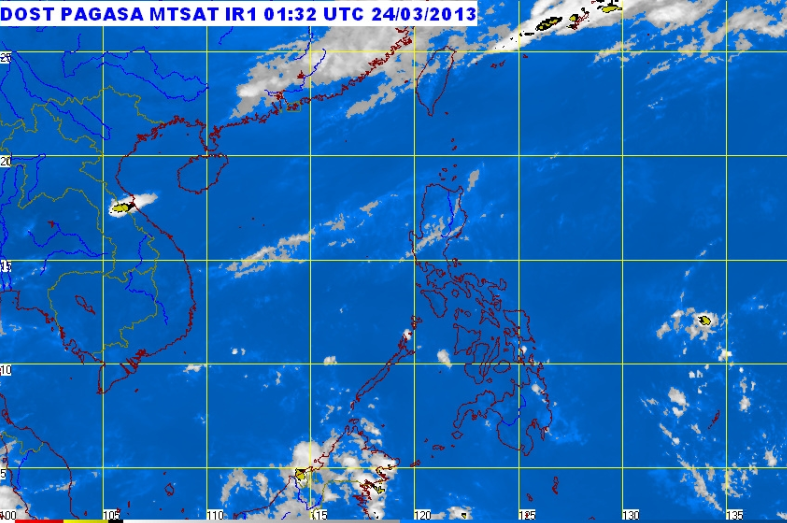 ﻿﻿On the latest bulletin for March 24 as of 10:00 am, there is no tropical cyclone existing within the Philippine Area of Responsibility (PAR). On a Twitter post of PAGASA, it said that thunderstorm is more likely to develop in Metro Manila today. 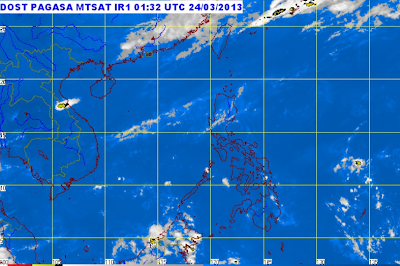 Aurelio said that the chance for tropical cyclone for the month of March will be zero to one. For the next two to three days, he said that temperature in Metro Manila is expected to range from 24 to 32 degrees Celsius. Cagayan Valley, the provinces of Aurora and Quezon, Bicol Region and Eastern Visayas will experience cloudy skies with light to moderate rainshowers and thunderstorms. Metro Manila and the rest of the country will be partly cloudy with isolated rainshowers or thunderstorms mostly in the afternoon. Light to moderate winds blowing from the east to southeast will prevail over Luzon and Visayas and from the east to northeast over Mindanao. The coastal waters throughout the archipelago will be slight to moderate. Over the last days, heavy rain fell on parts of Metro Manila, surprising residents who were getting used to the hot weather. PAGASA together with the National Disaster Risk Reduction and Management Council (NDRRMC) are expected to issue a more detailed outlook of Holy Week 2013 in the coming days. Special weather outlook includes if there will be a cyclone development on the observation period. The special bulletin will be disseminated to various localities for observation and any actions need to be taken.